If you love historical mystery thrillers, grab your free chapters of The People's Book PrizeWinner, The Grotto's Secret. Enter your details to download your free sample chapters. 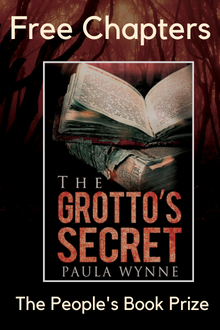 You will be entered into my mailing list for The Grotto's Secret. Your email will be kept confidential and you’ll only receive news about more free ebooks or exclusive offers and competitions. Click the button to grab your free chapters.